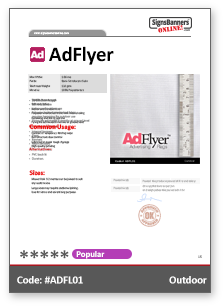 The AdFlyer Custom Flag material is a durable & lightweight fabric designed with business name flag printing in mind. When printed, the material allows the artwork to bleed through partially to the rear side. 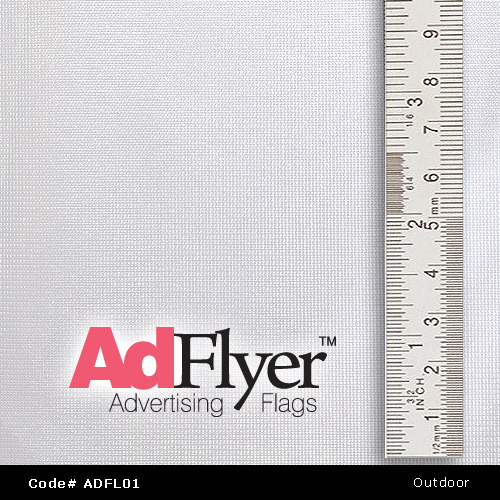 The AdFlyer can be made with a number of different finish & fixing options such as eyelets or sister clips, as well as a pole pocket/sleeve to suit your flag pole needs. "Corporate Flags - Great for displaying your corporate identity at formal fixed locations". Street flags as used by councils and street pole flags lining roads, city scape and corporate halyard street flagpoles. Not typically purchased under 20 x qty.